Medicare basics – what you need to know! By the time your 65th birthday rolls around, you may think you have insurance all figured out. But insurance can be complicated and confusing. Medicare, even more so. Do you know the difference between Part A, B, C & D? Or what a “donut hole” is? There is a lot to know and understand. But knowing where to turn for simple explanations and resources can really help. The most important thing is to understand how each part of Medicare fits together. Here is a broad overview so you’ll be fearless knowing you have the right Medicare plan when you or a loved one becomes eligible to enroll. Medicare is a federal health insurance program that covers people over 65 years of age, as well as qualified people of any age with disabilities, and people with End-Stage Renal Disease. Medicare has been federally regulated since 1965 when then President Lyndon B. Johnson signed the bill for Part A and B coverage. Today this is called “Original Medicare.” Part A covers hospital care and is free as long as the covered person has paid into Social Security for at least 10 years. Part B is medical coverage (meaning care received at a doctor’s office). It covers both medically necessary and preventive services. 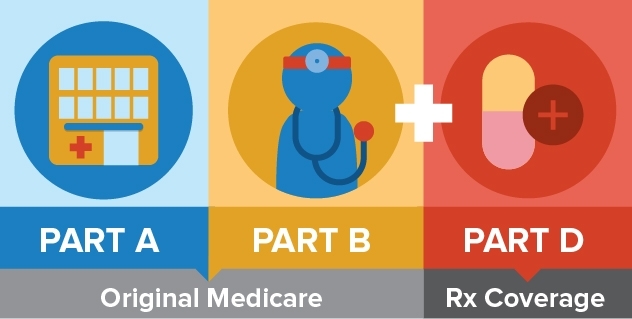 Since Medicare is federally regulated, private companies contract with CMS to provide Medicare Advantage Plans known as Part C. Part C plans from providers such as Regence, offer hospital Insurance (Part A) and medical insurance (Part B). Some plans also include prescription drug coverage known as Part D.
Prescription drug – or Part D – coverage, has a gap between when initial coverage ends and catastrophic coverage begins. This is known as the “donut hole.” Members spend more on covered drugs during the gap period, which begins when the member and their plan have spent a combined $3,310 on covered drugs. Once total drug costs reach $4,850, members transition into catastrophic coverage and the plan once again pays for most covered drug costs. Those are the basics. If you have questions or would like to learn more, visit regence.com/Medicare.